Or contribute to the well-being of young people in your community? Toujours ensemble is a dynamic and friendly environment that is always looking for people who want to help. Volunteers must be fluent in French. We are looking for people who are available on Mondays to Thursdays from 4:15 to 5:30 p.m. and from 5:30 to 6:45 p.m. Volunteers provide school support for Secondary 1 to 5 students. Interested candidates must be flexible and motivated and have an ability to listen. The organization is located a few minutes from the Verdun metro. We are looking for people who are available on Mondays to Thursdays from 3:30 to 4:30 p.m. Volunteers provide school support for Primary students. Interested candidates must be flexible and motivated and have an ability to listen. The activities take place in the Primary school. We are looking for people who are available on Mondays to Thursdays from 3:00 to 5:15 p.m. Volunteers provide school support for Primary students. Interested candidates must be flexible and motivated and have an ability to listen. The activities take place at our Carolyn Hayes Renaud Centre. Your donation funds our activities and ensures that we can keep working with youth. Annual fundraising campaign : Each year, over 600 youth aged 6 to 17 benefit from our programs and access a variety of services to help them improve their lives. School lunch campaign : The goal of the school lunch service is to improve the living conditions of our youth. Summer program campaign : Toujours ensemble offers diverse summer programming to nearly 200 children and teens from disadvantaged backgrounds. Christmas campaign : Each holiday season, we hand out Christmas baskets to 200 families, and 145 children receive gifts. Generous donors also sponsor families, who receive Christmas baskets and gifts for their children. Crowdfunding campaign : Our organization’s employees jump at the chance to join activities that fund special projects for youth. 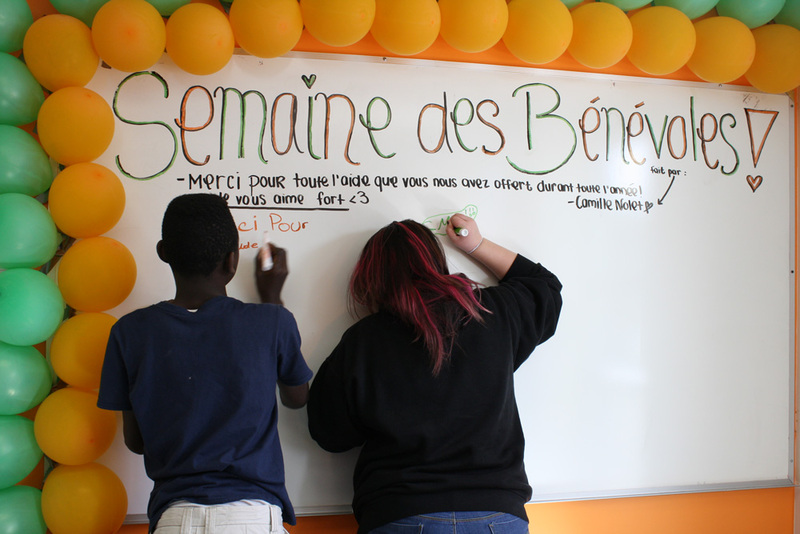 Want to raise money to help the young people at Toujours ensemble? A resource person at our organization can answer your questions and give you advice. Our event organization guide can also help you throughout each step of your project. Tax receipts can be issued for cash donations (some conditions apply). You can also get visibility on the Facebook and Twitter accounts of Toujours ensemble. Want to fundraise for Te while taking part in a sports challenge? It is possible to register alone or as a team for a sports challenge and fundraise for a good cause. Contact us for more information about how to collect money for a sports event. December is a very busy month for Toujours ensemble, as every year we run our Christmas campaign for Te families and members of the community. A part of this amazing campaign included sponsorships of Toujours ensemble families by people in the community. These families receive a Christmas basket tailored to their needs along with gifts for their children. The organization’s former members can volunteer and get involved in organizing events. A Facebook group was created to stay in touch with former Te members and support them with any academic or personal questions or issues. They can also get information about academic bursaries and opportunities for employment, internships or volunteering.